In my 40 years after receiving Jesus Christ as my savior from sin, I have experienced only about five “really sensationalistic” experiences in the Lord. The rest of these experiences were of a simple being led by Him in different situations, in showing me different things, yet in all things these experiences mesh into perfect timing, which I had no control over. I have added some graphics which I made of these experiences, partly because they are already found on the net, yet like the prophets of old, a lot of “Christians” want them as their own, or see them as emotionalism or even delusional, while the vast bulk of others could care less! Yet even with being taught the ways of the Lord, (walking in the Spirit) and the ways of the adversary by one of only two top exorcist’s in Baltimore City at the time, has only served to reinforce my understanding that most don’t really want to know HIM, even if they could digest it. I have contacted many “big name” media preachers in my life, and one was even the personal boss to a family member; yet all but Jack Van Impe ever even bothered to get back in touch with me. Jack had used an eschatology example I had written about Israel blossoming in 1967, not 1948 in a letter: and months later some Anglican Priest was credited with coming up with the idea, which I just happened to be had watching on his broadcast while studying at Kings Point, NY. He did however send me a long letter back, with a lot of free books! Anyway, Angels, Devils, and supernatural events, are far more likely to be accepted and viewed by the masses, than the events of a true follower of Jesus Christ. I was always instructed not to talk about spiritual events to an outsider of actual brethren. And I can tell you if you do, you will open yourself up to scorn and ridicule, by those who have not the living experience of Jesus Christ within them, unless of course it befits the systematic theology of which they preach, to bring in others while filling their coffers! This is why you shouldn’t share the things of God (cast your pearls) at dogs and pigs, as they will turn on you and attempt to devour you! Even in my near death experience, by expressing openly that the Lord was next to me when my heart stopped, is seen as simply delusional by some who claim to follow Christ. This only shows me that people will believe what they like, and as it is written in Luke 16: 32 And he said unto him, If they hear not Moses and the prophets, neither will they be persuaded, though one rose from the dead. Disbelief is the issue here, and even when Christ was risen from the dead, (which the above verse foreshadows) people would still not believe. 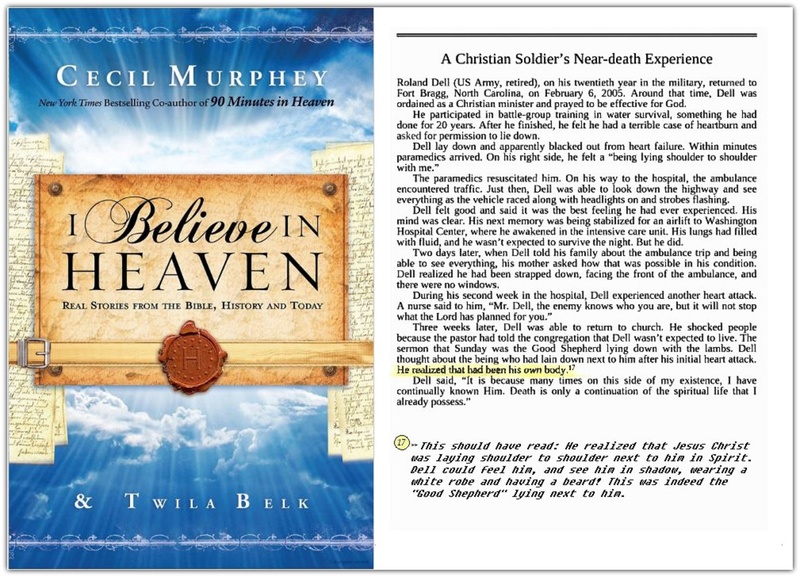 This is what I experienced with the “Near Death” community, who claimed to be open minded, only I mentioned the name of Jesus Christ, which buys you rejection, and incidentally was excluded from the book: “I believe in Heaven” by Cecil Murphey & Twila Belk who edited my testimonial, as seen below. My NDE: An unfortunate A misrepresentation to what actually occurred to me. Working backwards, just after my marriage, my Lord gave me a vision of a “Pastor’s Heart”, as the local church ant-Christ (Pastor) said “he did not see me as a Pastor”, and attempted to destroyed some of the work the Lord has done within me when I was courting my wife, even while having a years’ worth of confirmation by the Lord that, “she was the one” if I chose to be married in his sight. This is partly why the lord gave me the short vision, which was to be confirmed to me the early next morning on the radio broadcast “Truth for Life”, with Alistair Begg. He explained that the word “Pastor” was derived from the word “PASTURE”, and it was only God, who gives a man a “PASTOR’S HEART”! In simple terms, the Lord was simply confirming to me that I was in the right place with him, but not the surrogates (Pastors), who claimed his name! While learning how to “walk in the spirit” while studying in street ministry, I had about three miraculous experiences, one is a sketch I made when the Lord was attempting to get my attention while in a temporarily carnal state, (which certainly worked for me) even though it happened but for an instant, seen in the graphic which I hastily drew below at the time. The last graphic, is of the sword (word of God) going out to the world, a dream I had in the mid 80’s. The late Dr. Gross explained; the sword of God had a gold handle for the Lord to grip, a silver double-edged blade symbolizing redemption, and the old wooden box (wood symbolizing man) was indicative of my body in which the sword was housed in, and that it would go out to the world one day. I use this graphic for the background on my website. I had a psychologist once tell me, (when sharing some spiritual experiences with him) that “there are many things phycologist just don’t know, and if they ascribe all these things to the mind, they ain’t much of a psychologist”! So for what it is worth, enjoy the images.